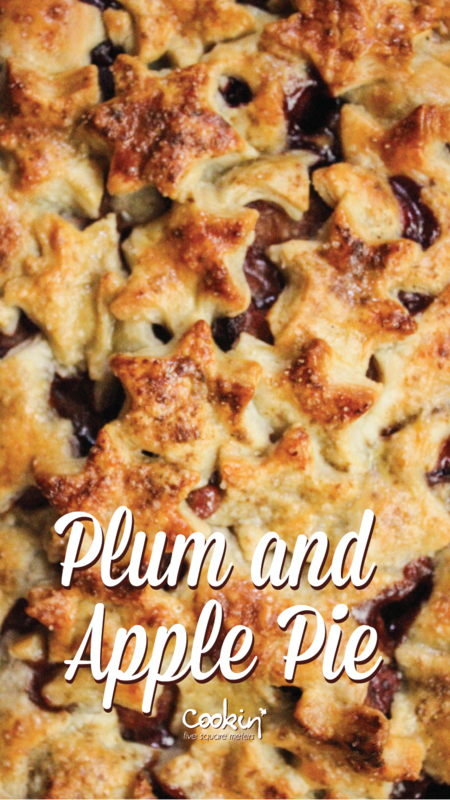 I’m going to give you apple and plum…. It’s the end of the season. A good covered pie is still on my mind. 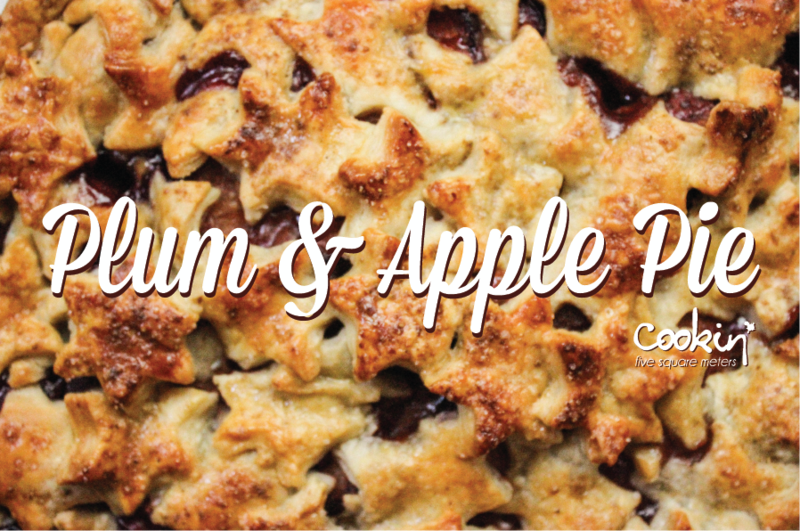 I brought granny Smith apples and some red plums to bake. As always, I get busy with something else, or put the project on hold until I have more time and a better mindset. My little sister doesn’t share this notion. She swept the whole bag of apples. All but one, as I discovered later. Pie day arrived, I walk into the kitchen, thaw the dough I made earlier, pick up the bag of plums, and the one lonely apple I find and start slicing. I lock in the rage about the apples and release it onto the plums. Juicy and blood red, perfect for pie, sliced and tossed in spices. No sugar needed since some brown sugar caramel was drizzled over the fruits. I decided to pour over the caramel to stop myself from licking the jar clean. The festive season is on. I’ve decorated the pie with little stars and fell in love with the texture it created. At home, I haven’t started with any festive spirit yet because I got struck with this damn flu and I was barely able to lift my head and do anything but make a ginger-garlic-onion-loaded noodles soup to try and cure myself. Nothing. I guess I’ll have to try the mind over matter treatment. Hope it’ll work. I think I got this thing from being in a crowded open place, with few layers on, aside from my fat, eating and drinking then heroically getting out into the cold. But I’ve had a good time. It was a wonderful Christmas Fair, with delicious foods at the local recurring food market; Souk El Akel. My belly was happy! 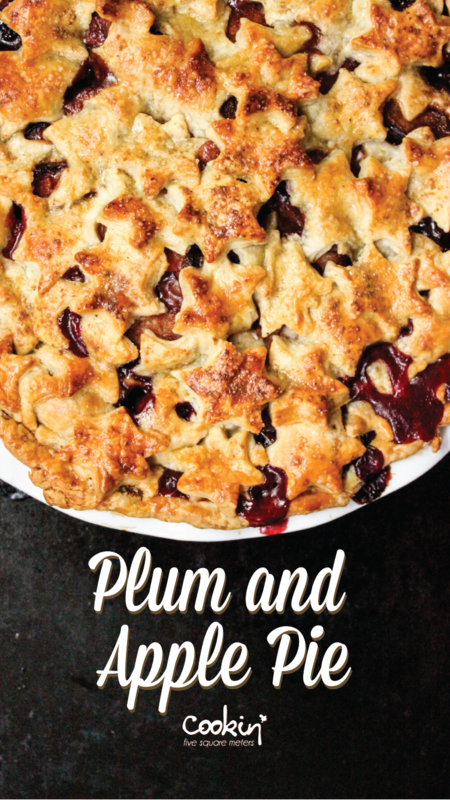 For the filling, pit and slice the plums. Add the flour, cinnamon, nutmeg, and cloves and it well. Thinly slice the apples and set aside. On a clean flat surface, lightly sprinkles with flour, roll out the dough with a rolling pin. Always roll away from you and rotate the dough with each roll. Roll the first half a little larger than the pie dish you have. Carefully roll the dough on the rolling pin and turn it to catch the whole dough on the pin. Unroll the dough over the pie dish and cut the excess, leaving a couple of centimeters. Arrange the sliced apples then the plums adding the caramel in between and on top. Repeat the rolling process with the second dough half and either cover when pie, or play around with covering it like I did. If you’re covering it all, make sure to leave a cross mark in the center to let the steam escape. If you’re layering the cover, brush with tops with the mixture of and egg with a bit of water. Sprinkle with sugar to create a pleasant texture on top of the crust. And here is my giveaway for this post. I fell in love with the texture of the pie and with the photos I took. So I decided to make a wallpaper for my phone and share it with you. This entry was posted in Dessert, Recipe and tagged apple, best pie, best pie crust, chef, chefs in lebanon, christmas fair, cooks in lebanon, flaky crust, food, food market, free iPhone wallpaper, giveaway, granny smith, lebanese bloggers, lebanon, Pie, pie crust, pie wallpaper, plum, plums, recipe, souk el akel, wallpaper. Bookmark the permalink.